especially to perform Shostakovich Piano Trio No 2. Praised as "an artist with an already expanding reputation and great future" (The Well-Tempered Ear), cellist Andrew Briggs performs on an international scale. Recent recitals include those in his native Colorado to concerts in Italy and the UK. His travels have taken him to a growing list of prestigious music festivals, including the International Holland Music Sessions (NL), the Abbey Fontfroide Masterclasses (FR), and as a Fellow of the Aspen Music Festival (US). Andrew’s 2016-2017 season includes both solo and chamber engagements. In October 2016, he was one of few international students selected to perform in a master class at the Cello Biennale in Amsterdam (NL). Recent recitals include solo programs at the Remonstranse Kerke in Alkmaar, Netherlands; the Abbey Fontfroide in Narbonne, France; Morphy Hall at the University of Wisconsin, Madison; and on the Sunday Recital Series at West Middleton Lutheran Church in Wisconsin. Last March, he performed works by Dvořák with the Middleton Community Orchestra (WI). A dedicated performer of all eras of music, Andrew plays music from Baroque to contemporary, Studying Baroque cello with Phoebe Carrai at the Juilliard School, Andrew most recently performed with the Madison Bach Musicians and as a continuo cellist for UW-Madison’s opera production of Mozart’s Le Nozze di Figaro. Andrew also enjoys playing music of contemporary composers, playing with the New Muse Ensemble and Domaine Musicale of Madison, Wisconsin. At Juilliard, he performed chamber music works of contemporary composers in the FOCUS! Contemporary Music Festival, ChamberFest, and with Axiom Ensemble. Past season highlights include a performance of the Dvořák Cello Concerto with the Middleton Community Orchestra, performances with the Juilliard Chamber Orchestra as a principal cellist, Carnegie Hall concerts with the New York String Orchestra Seminar, chamber music performances with Royal Concertgebouw Orchestra principal cellist Gregor Horsch, and as solo cellist for UW-Madison’s production of Britten’s opera Albert Herring. During the summers, Andrew performs in the cello sections of the Colorado Symphony and Colorado Music Festival Orchestras. Andrew balances his performance career with teaching. As an educator, Andrew was involved with the Juilliard School’s Educational Outreach Department: performing outreach concerts as a Gluck Community Service Fellow, and teaching at the Harlem School for the Arts as an Arts Enrichment Fellow. He also taught in the classroom at Juilliard as an Ear Training Teaching Fellow while being a mentor for the Juilliard Pre-College String Ensemble. In 2016 - 2017, he joined the faculty at the University of Wisconsin – Oshkosh as instructor of cello and music business, and performed with the Elmwood String Trio as Artist in Residence. 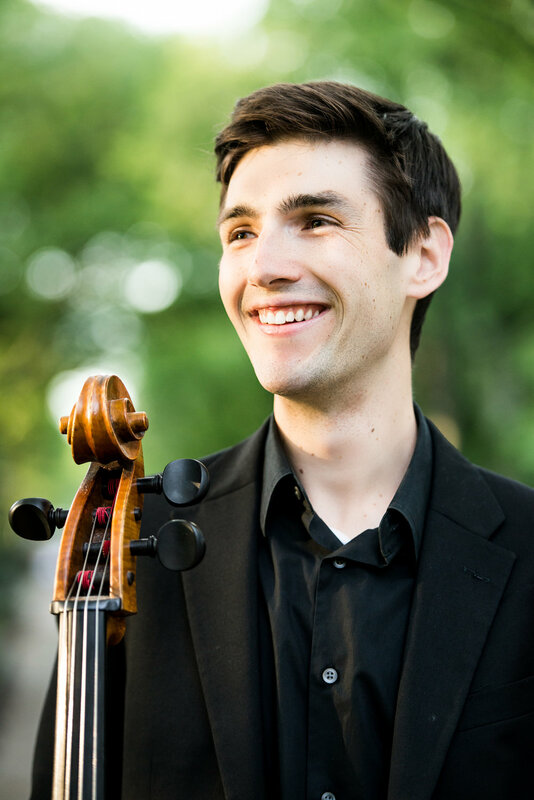 Andrew graduated from the University of Colorado at Boulder, completing his undergraduate degree in cello performance as the College of Music’s Outstanding Graduate. Studying with Professor Judith Glyde, he won the Honors Competition, leading to performances of the Dvořák Cello Concerto with the CU Symphony and the Longmont Symphony. He attended The Juilliard School as a Master of Music degree student of Richard Aaron, and studying chamber music with members of the Juilliard Quartet, the Beaux Arts Trio, and the Chamber Music Society of Lincoln Center. Andrew recently graduated from the University of Wisconsin – Madison, completing his Doctoral studies as a student of Uri Vardi. His doctoral project, "Piatti and the Body: An Integrative Approach to Learning the 12 Caprices, Op. 25," can be found on Youtube.com.